Know of any fellow pet sitters who might be in the market for Pet Sitting Software? If so, be sure to take advantage of the Time To Pet Referral Program! For each new client that you refer to us that activates their account, TTP will give you a credit of $15 for each active staff member they had during their first paid month. For example, if you referred us a company that had 10 active staff members, we would provide you a credit of $150. 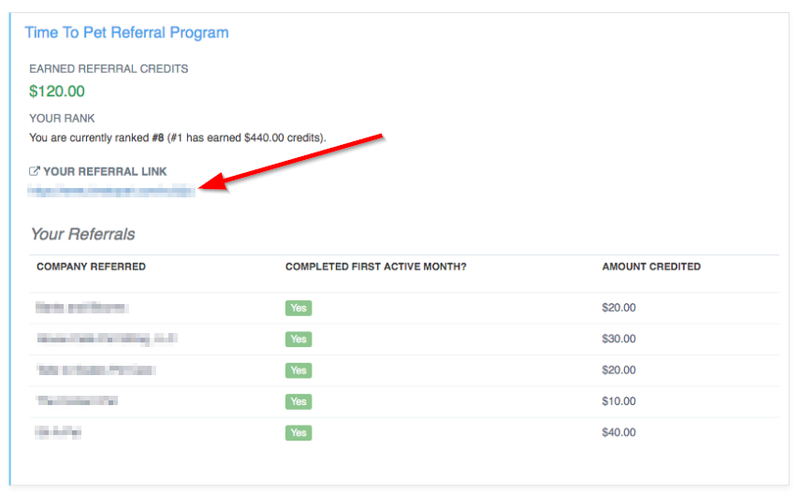 Referral Credits are automatically applied to your next TTP monthly bill and are maxed at $250 per company referred. In addition to you receiving referral credits, the company that you referred will get their first three months at 50% off (in addition to our free trial). Talk about win-win! In order to track Client Referrals, Time To Pet has created a Referral Link for all clients. This Referral Link can be found in the Billing Section. You can also see how many total referral credits you've earned, where your referral credits rank, and which companies you've referred! Check out the GIF below to see where to find your referral link!